How to spend your summer holiday? Go skiing, of course! I was a bit anxious about the journey to Argentina. Firstly, it is far away, Ushuaia lies really at the end of the world. Secondly, last year our baggage did not arrive in time, it got lost somewhere on the way to Buenos Aires. And thirdly, I can’t speak Spanish. But surprisingly, everything went really smoothly this time. Even the journey did not seem so horribly tiring. Probably because we had knee high compression socks this time! Ushuaia has made a strange impression on me. We have been a bit unlucky with the weather for the last two years. It was just slightly below zero with some showers, puddles everywhere, mud, wind, more puddles and even more mud. Then all of a sudden the sun came out and shone through it all and you could see the sea, the lighthouse, ships, and above it all beautiful snow capped pointed mountains rising straight out of the sea. Arriving in the town at the roundabout on the pedestrian crossing an old shabby dog was standing. We slowed down. It carefully checked both sides, first to the right, then left, and when it saw us stop, it slowly limped across the road, looking proud. We’re looking forward to the mountains, to skiing. Tierra Mayor is a stunning little valley in the mountains, about 20 kilometres from the town and only 200 meters above the sea level. But one feels like it is high, high up in the Andes. The centre of all the happenings is the Tierra Mayor public house. Last year, when we opened its door for the first time and tentatively came inside, we did not see many people around. There was a fire burning in the fire place and the stove, a waiter was standing about at the bar, the tables were perfectly laid as if ready for a wedding reception. The waiter approached us and asked something in Spanish. We answered back with a question in English, something on the lines where in the area we can go skiing. The waiter smiled: “Ushuaia Loppet?” He said a few more words in Spanish and then called out: “Maria!” A tall middle-aged woman with a head scarf and a flour stained apron came hastily out of the kitchen, smiling from ear to ear and with her arm extended. 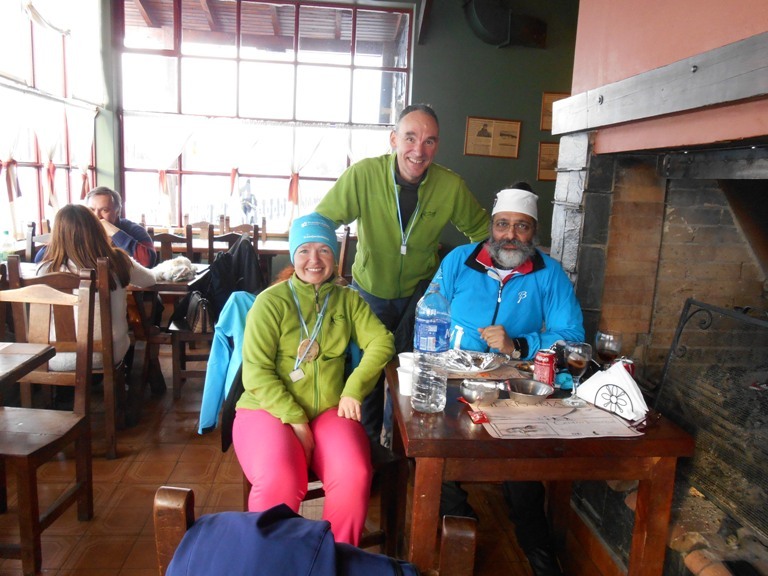 It was Maria Giro, an ex-Argentine national team member in biathlon and she gave us all the advice: “You keep your skis here, you get changed here, you ski a 10km loop towards the eastern side of the valley and then a 10km loop towards the western side, you can’t get lost. And when you’ve had enough, we serve great lamb.” And great it was! Even the preparation for the race proceeded in the same atmosphere. The weather decided not to make it any easier for us, and on the race day last year the route was basically impassable – it was raining heavily, actually raining cats and dogs, and it was so windy that even the dogs wanted to stay inside. It was decided that the race would be happen one day later, on Sunday. It was not such a problem, considering that there were only about 30 of us. On Sunday morning we all met at the fireplace in the pub, chatting and joking. Everybody was trying to prolong those precious moments in the warmth of the pub for as long as possible. Then, suddenly somebody got up: “Shall we go then?” And we went for it. We fought our inner selves, the track and the weather. A couple of hours later we came back to the fire, feeling happier, more tired and hungrier. This year, everything was a bit more official, more competitors, more organisers…But the same hospitality in Tierra Mayor and perhaps even more delicious lamb. The next stop on the programme was Merino Muster in New Zealand. The journey from Argentina to New Zealand is also incredibly long but I was excited and was hoping to see a bit more than last year. New Zealand is beautiful. Everything is clean there, everything smells nice, the grass is greener, the sky is bluer and the air is fresher. Unfortunately, my excitement was somewhat pre-mature. When we set off on Tuesday morning to Ushuaia airport, the waves suddenly started coming in high, a white thick curtain started falling from the sky covering all the mountains around and was approaching us dangerously fast. We parked the car outside the entrance to the terminal building and were scared to open the car door. The wind was incredibly strong. The flight to Buenos Aires was to be delayed by 6 hours. Great! We always leave ourselves a decent time margin, but with such a big delay we did not stand a chance to catch our connecting flights. Oh well, what else to say? Perhaps only that we started our journey on Tuesday morning and we got to our accommodation in Snow Farm in New Zealand on Friday afternoon, before our Saturday race. Fortunately, we got all our luggage in time. Fortunately, we did not have to put on the snow chains. And fortunately, the weather was good. One just has to stay positive. Merino Muster is a very well organised race in a beautiful surrounding just made for cross-country skiing. A bountiful raffle after the race was a lovely gesture this year so one can say that everybody got a prize, even if you did not come first. The journey to Australia went smoothly. It was our fourth time in Falls Creek this year. For me, our stay in Diana Lodge is always the peak of my holiday. Every time it is like you’re coming back home. The owner Lisa and her mum really try hard to make every guest feel this way. Lisa is gorgeous, she looks like a Snow Queen and that is not all. She can do magic. Well, she does not do it on her own, she has got helpers but you would definitely agree with me if you came for dinner. Like every year, the track to Kangeroo Hoppet was perfectly prepared. However, nearly like every year the weather decided to complicate things a bit at the last minute. It was raining and pouring the night before the race and in the morning it was warm and so foggy that we could barely see each other. What a pitty! Despite all that, everybody was still happy. The main thing was that the race went ahead. So this was our tour round the southern hemisphere. Lots of memories, lots of new friends, a couple of souvenirs and after the stay in Diana Lodge 3kg heavier. Any negatives? Perhaps only that it was more difficult to fall asleep. Is it perhaps because there is no Big Plough in the southern hemisphere to take you to the dreamland? This entry was posted in News 2015. Bookmark the permalink.